you're embarrassed to admit you haven't seen? I'll admit that I haven't seen the best known works of Alfred Hitchcock, Martin Scorsese and Billy Wilder, but I have seen movies by them (Hitchcock The 39 Steps, Scorsese Alice Doesn't Live Here Anymore and Wilder The Lost Weekend). What about you? Any you want to get off your chest? 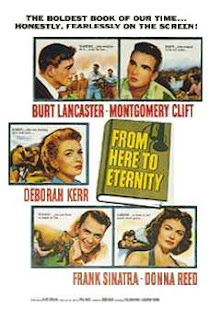 When the movie From Here to Eternity is mentioned, people usually think of that famed adulterous kiss Burt Lancaster and Deborah Kerr share on the beach, the waves brushing up against them to cool their burning passion. But there's more to this Best Picture winner than the celebrated lip lock. Set in Hawaii during the months leading up to the attack on Pearl Harbor, Pvt. Robert E. Lee Prewitt (Montgomery Clift) is transferred to Schofield Barracks. At his previous post Prewitt was a bugler and the unit's top boxer, the latter makes Capt. Dana Holmes (Philip Ober) constantly tell Prewitt to join the boxing team and he refuses. First Sgt. Milton Warden (Lancaster) suggests to make life difficult for Prewitt in order for him to change his mind. As the other soldiers make his life a living hell, the only soldier that supports Prewitt is his friend Pvt. Angelo Maggio (Frank Sinatra). As all of this is happening, Warden begins an affair with Holmes' wife Karen (Kerr) who's unhappy with her marriage. The relationship goes well until Karen asks Warden to apply for officer training; problem is Warden doesn't want to be an officer. Another thing that From Here to Eternity is famous for is the rumor that Frank Sinatra called upon the Mafia to get into the movie. Yes, he desperately wanted the role, but he didn't go that far to get it. As most people know, author Mario Puzo used that rumor for his novel The Godfather for the character of Johnny Fontane. And Sinatra was not too pleased about that. There's one scene in the movie, I'll admit, that I got teary-eyed over. Maggio had been beaten to death, and a mourning Prewitt plays a sorrowful "Taps". The scene cuts from him to the other soldiers listening feeling remorseful for the soldier they once abused. It goes back to Prewitt with tears running down his face. When he finishes playing, he just walks away without saying a thing. Heartbreaking. With today marking the one-year anniversary of his death, I thought it would be appropriate to review one of Paul Newman's movies. Newman plays Frank Galvin, a washed-up alcoholic lawyer. His firm isn't doing so well; he has lost four cases in the last three years, and he stooped to ambulance chasing. His friend Mickey (Jack Warden) shows him a medical malpractice case involving a woman who's in a coma after a botched surgery. The original plan was to give the family a settlement outside of court, but after seeing the woman Galvin decides to take on the case. Sidney Lumet, as I've mentioned before, is a very skilled director. Even though The Verdict came out 25 years after 12 Angry Men, Lumet clearly shows he still knows how to direct a courtroom drama. 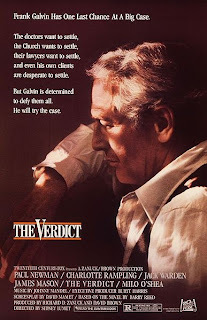 Now mind you, I've only seen three movies with Paul Newman in them (Butch Cassidy and the Sundance Kid, The Verdict and Road to Perdition), but Newman delivers one of the best performances of his career in The Verdict. Suggestion: Watch this as a double feature with 12 Angry Men. 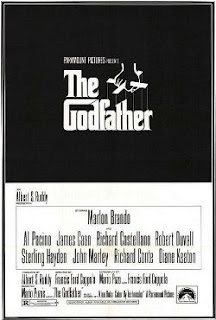 Usually members of the Academy of Motion Picture Arts and Sciences (AMPAS), better known as the Oscars, are suckers for gangster movies (i.e., The Godfather, Goodfellas, The Departed). 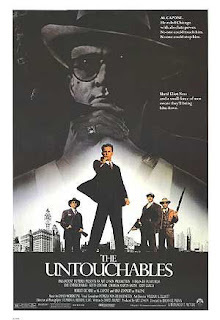 The Untouchables is definitely one of those movies. Garnering four Oscar nominations and winning one for Best Supporting Actor, The Untouchables is a notable movie from director Brian De Palma. Eliot Ness (Kevin Costner) is in charge of bringing down the power of gang leader Al Capone (Robert De Niro). Finding that doing such a task by himself is a challenge, he gains help from Irish cop Jim Malone (Sean Connery), police trainee George Stone (Andy Garcia) and accountant Oscar Wallace (Charles Martin Smith). Together, they take down Capone's power over the city of Chicago. De Niro definitely nailed the role of Al Capone. Anyone that has seen his earlier work in The Godfather Part II can agree with me. ~The taxi cab scene in On the Waterfront. That scene shows very clearly how Marlon Brando got an Oscar for that movie. ~The New Year's scene in The Godfather Part II. Just thinking about it sends chills down my back. ~Shark shows up in Jaws. Anybody that's seen that scene probably vowed never to go swimming at the beach again. EVER. ~The "mad as hell" speech in Network. Just watch that scene and you'll see how Peter Finch got that posthumous Oscar. ~Bluto smashing the guitar in Animal House. The fact that he apologizes makes it even funnier. ~The opening scene of Manhattan. The images are just beautiful. Those are mine. What are yours? In honor of her 85th birthday today and recent news of her to receive an honorary award in November, I've decided to review Lauren Bacall's best-known work: To Have and Have Not. The movie is set on the Carribean island of Martinique during the second World War. Harry Morgan (Humphrey Bogart) and his alcoholic friend Eddie (Walter Brennan) are having difficulty getting business. Harry's offered to smuggle people onto the island. He refuses, but accepts after a client who owes him money is killed. Before he starts smuggling, Harry starts a relationship with Marie "Slim" Browning (Bacall), a singer at a club that Harry frequently goes to. 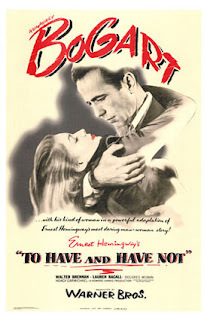 This movie, as most cinephiles like me know, created the real-life relationship of Humphrey Bogart and Lauren Bacall. Bogart, who was married during the production of To Have and Have Not, became attracted to the rising star. They were married in 1945, but the marriage ended in 1957 when Bogart died of cancer. Bacall's work in the movie is stellar. It baffles me that she wasn't nominated for this, and it baffles me ever more that it was fifty-two years after she started acting that she received an Academy Award nomination (and didn't win to top it off!). This past Monday marked what would have been the 100th birthday of Academy Award-winning director Elia Kazan. The director is known for two things: directing such movies as Gentleman's Agreement, A Streetcar Named Desire and On the Waterfront, and his House Un-American Activities Committee testimony, the latter making him one of the most controversial directors until his demise in 2003. On the Waterfront explained what he felt. Ex-prizefighter Terry Malloy (Marlon Brando) unwittingly becomes a pawn in the murder of longshoreman Joey Doyle. The murder was set up by union boss Johnny Friendly (Lee J. Cobb), who has also done other illegal activities, with the help of Terry's brother Charley (Rod Steiger). After finding out about the murder, Terry starts to feel guilty for being part of it. Joey's sister Edie (Eva Marie Saint) and Father Barry (Karl Malden) urge Terry to admit his wrongdoing. By now, the movie's topic is rather dated but its impact is still as strong as ever. 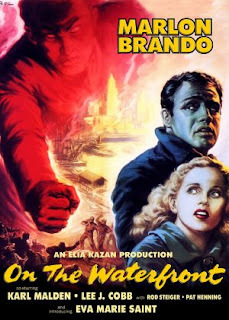 It's no surprise that Marlon Brando, Eva Marie Saint, Karl Malden, Lee J. Cobb and Rod Steiger were all nominated for Academy Awards, with Brando and Saint winning (Malden, Cobb and Steiger lost to The Barefoot Contessa's Edmond O'Brien). Their performances are ones that you will remember long after the credits have rolled. 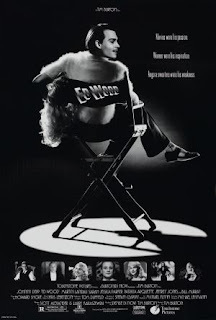 When Ed Wood was released on October 7, 1994, critics lauded it, while audiences ignored it, making it Tim Burton's best reviewed movie of his career and his first box-office bomb. Ed Wood is a biopic on Edward D. Wood, Jr. (Johnny Depp), claimed "the worst director of all time". It also focuses on Wood's friendship with an aging Bela Lugosi (Martin Landau) and Wood's cross-dressing habit. The rest of the cast is very elite. Sarah Jessica Parker is Ed's girlfriend Dolores, Patricia Arquette is Ed's future wife Kathy, Jeffrey Jones (of Ferris Bueller's Day Off fame) is TV psychic Criswell, Lisa Marie (Burton's then-girlfriend) is TV hostess Vampira and Bill Murray is Ed's friend Bunny Breckinridge. The movie overall was very good. Landau's performance of Bela Lugosi definitely earned that Oscar. Burton's direction, Depp's acting, and Scott Alexander and Larry Karazewski's screenplay should've at least been nominated. I don't think I've ever since such an optimistic character like Ed Wood, particularly in one scene at the beginning of the movie. Ed brings a review of his play for the actors to read. Despite the fact that the review is mostly negative, Ed points out that the reviewer said the costumes were very realistic. You gotta love a guy like Ed. Basically everybody knows who George Lucas is. But a lot of people don't know what Lucas did before Star Wars. 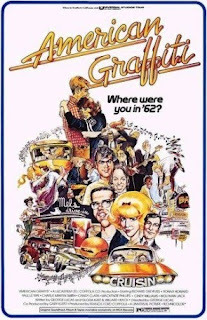 American Graffiti focuses on four teenagers that graduated from high school, and are starting new lives. Curt Henderson (Richard Dreyfuss) and Steve Bolander (Ron Howard) both got accepted by the same college, but Curt's having second thoughts on going. Steve's girlfriend and Curt's younger sister Laurie (Cindy Williams) is also unsure of Steve leaving, but Steve assures her of his departure, claiming that seeing other people will strengthen their relationship. Curt, Laurie, and Steve head off to the freshman Sock Hop, but while cruising, Curt sees a blonde (Suzanne Somers) in a white Thunderbird who mouths "I love you", then drives away. That soon becomes Curt's mission. Terry "The Toad" Fields (Charles Martin Smith) gets to watch over Steve's ‘58 Chevy Impala for the night and while Steve's at college. He soon picks up a girl named Debbie Dunham (Candy Clark). Thinking that it's his car, she's convinced that Terry's a smart kid. Smart enough to get a bottle of whiskey while being underage. Later, however, Steve's car gets stolen. John Milner (Paul De Mat) is a rebel who owns a yellow deuce coupe. He gets tricked into watching over a young girl named Carol Morrison (Mackenzie Phillips). At the beginning, they don't get along, but after trashing someone else's car, they become friends. John's continually provoked by Bob Falfa (Harrison Ford), a street racer. I really enjoyed American Graffiti. I kept forgetting that Lucas directed it, despite the fact I saw this before the original Star Wars trilogy. Well, I've ranted enough. What are some you can't stand? Most sequels are inadequate to the original movie (Speed 2, anyone? ), but one in a while the sequel is better than the original (i.e, Aliens, The Dark Knight). The Godfather Part II definitely falls into the latter. 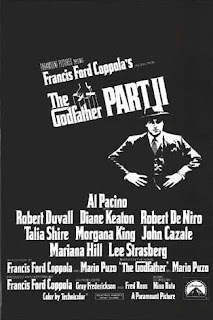 The movie has two plots: one of them, told in flashbacks, is about Vito Corleone (Robert De Niro) and his rise in the Mafia. The main plot of the movie is Michael's (Al Pacino) rise to power in the Mafia. Although his power as a Mafia don is rising, his life is deteriorating. Pacino gave the performance of his career in this. How he didn't win is beyond me. John Cazale was also standout with his role of Fredo. De Niro definitely earned his Oscar for his role of Vito Corleone. ~ The New Year's party. That scene alone pretty much summed up how Pacino got nominated. Also, that kiss he gives to Cazale gets up there with the famed kiss in the movie From Here to Eternity. ~ Kay telling Michael that she had an abortion, not a miscarriage. His reaction: he hits her face. But, in some ways, Kay delivered the bigger blow. ~ Connie trying to make Michael forgive Fredo. She tries desperately to crack Michael's cold-hearted shell, much to no avail. The scene also shows how Talia Shire, the actress who plays Connie, was nominated for her brief performance. Francis Ford Coppola definitely managed to make a name for himself during the 1970's. He won an Oscar for writing Patton (which also, interestingly enough, had the lead actor refuse his Oscar when he won), then later Oscars for writing The Godfather, and producing, directing and writing The Godfather Part II. Not bad. You see this all the time: who was considered for a certain role in a movie and they either were just considered or they turned it down. One list on Den of Geek just cracked me up (here's the link). Do you know of any other bizarre casting choices? In this new monthly feature, I will be examining the book and movie and see what's worth checking out. This week: the immortal crime classic The Godfather. And it's not going to be easy not to give away too much. The book and movie focus on the Corleones, an Italian-American Mafia family. The leader of the family is wise and aging Vito. He has four children; arrogant and cocky Sonny; Fredo, whom everyone assumes isn't too bright; Michael, who doesn't want anything to do with his family's business; and Connie, the youngest child of Vito. The plot of the book and movie is about a gang war between the Corleones and the other four families of New York. After turning down a deal with drug dealer Virgil "The Turk" Sollozzo, Vito is gunned down. Sonny becomes head of the family with Michael helping to keep the family together, despite his wishes. 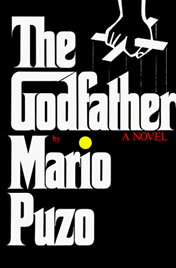 The movie, which came out three years after Mario Puzo's book was published, would later become one of the greatest movies ever made. It started the careers of several actors in the movie (or, in Marlon Brando's case, re-started), as well as Francis Ford Coppola's career as a director. Once you hear that lone trumpet playing the first notes of the opening music, you just know you're watching something ledgendary. One notable difference between the book and the movie is the ending. In the book, Kay accepts Michael's role as the Don. However, the movie paints a different and more dreary picture. The movie's ending shows Kay's realization of what Michael had done since becoming the Don. What's worth checking out? : Both are definitely musts for anyone. 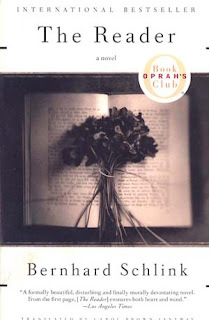 Most people know Bernhard Schlink's novel a little better now since Stephen Daldry's film adaptation came out last year, especially since the movie earned Kate Winslet her overdue Oscar. Anyway, back to the book. I managed to finish it in one day because it was very gripping (but that's the last time I stay up that late to finish a book). The book is set during late-1950's Germany and the lead is 15-year-old Michael Berg who becomes ill on his way home. 36-year-old tram conductress Hanna Schmitz notices him, cleans him up and sends him on his way. Months later after fighting hepatitis, he visits Hanna to thank her for her help, only to realize he's attracted to her. He visits her again days later and she seduces him, which leads to a secret affair. After months of dating, Hanna disappears without a trace. Years had passed and Michael is in law school. He attends a trail where women who served as SS guards at a Auschwitz satellite are being tried for allowing 300 Jewish women to die in a fire inside a bombed church during camp evacuation. Much to Michael's surprise, Hanna is one the defendants and he discovers a secret Hanna has been hiding from him. As I mentioned on my first post, this was one of my favorite books. I liked how it was told from Michael's point of view because you feel his pain when he discovers Hanna's on trial. The romance of Michael and Hanna is very romantic. When the 1960's began, the Cold War was still going on and most people were anti-Communist. 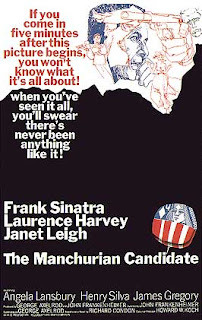 Apparently, Hollywood starting hitting close to home with movies like The Manchurian Candidate. During the Korean War, a platoon of American soldiers is captured by Communists. A year later, the platoon escapes and returns to the United States where Staff Sergeant Raymond Shaw (Laurence Harvey) receives the Medal of Honor for his actions. However, one of Shaw's fellow soldiers, Major Bennett Marco (Frank Sinatra), finds all of this peculiar and tries to find out what's going on. Harvey and Sinatra's performances in the movie were definitely Oscar worthy, but it was the only Oscar-nominated performance in the movie was Angela Lansbury's sinister role as Shaw's mother. And, boy, she earned that nomination. I don't think I've ever since a person that cold-hearted. Well, not since I saw The Godfather Part II. Not a lot of people think of the Cold War as a topic for a comedy. However, Stanley Kubrick's Dr. Strangelove managed to break that mold. Brigadier General Jack D. Ripper (Sterling Hayden) goes crazy and sends B-52's to bomb the Soviet Union because the Communists are going "sap and purify" the "precious bodily fluids" of the American people. Group Captain Lionel Mandrake (Peter Sellers) finds out that Ripper's attack is a fraud and tries to make him send the planes back. At the Pentagon's War Room, Air Force General Buck Turgidson (George C. Scott) tries to convince President Merkin Muffley (Sellers again) to do a full-scale attack on the Soviet Union. Muffley calls the Soviet Premier Dmitri Kissoff, who tells him if the Soviet Union is bombed, a Doomsday device will be set off. 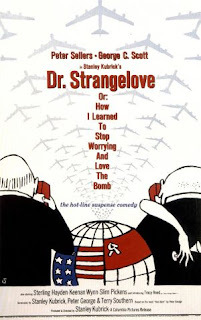 Muffley calls over ex-Nazi Dr. Strangelove (Sellers' third role) to explain the mechanics of the Doomsday device. This is definitely one of Stanley Kubrick's best-known works, as well as Sellers'. I'm not sure which of his performances I liked the best; Mandrake's a little too serious (at least until he orders Colonel "Bat" Guano to shoot the Coca-Cola machine for money) and Muffley was as well (excluding his line "Gentlemen, you can't fight in here. This is the War Room! "), and Dr. Strangelove was his funniest role (particularly the last scene where his right hand is either trying to strangle him or do the Nazi salute).